Frequently Asked Questions about the Armenian Genocide Debate is a section of information where questions sent by our visitors are answered to inform you quickly. What is Presidential Candidate John McCain's Position On Armenian Genocide? John McCain, the Republican candidate for president in 2008 had refused to accept the genocide and lost the Armenian voting bloc. However, in a visit to Georgia after the presidential election he accepted it in order to gain the Armenian voters for his upcoming Arizona elections. What is Presidential Candidate Barack Obama's Position On Armenian Genocide? Barack Obama has talked about the Armenian Genocide on TV, in Senate, and on his website, with great support for the Armenian cause of recognition of the Armenian Genocide. Barack Obama has been a strong supporter of "US-Armenian" relations and claims there is a common goal for fighting against terrorism together. I shared with Secretary Rice my firmly held conviction that the Armenian Genocide is not an allegation, a personal opinion, or a point of view, but rather a widely documented fact supported by an overwhelming body of historical evidence. The facts are undeniable. An official policy that calls on diplomats to distort the historical facts is an untenable policy. As a senator, I strongly support passage of the Armenian Genocide Resolution (H.Res.106 and S.Res.106), and as President I will recognize the Armenian Genocide. Barack Obama recently declared that he will not do as promised and accept the Armenian Genocide because he wants Turkish-Armenian relations to improve. Why do the Turks always refuse to admit the Armenian Genocide? You mean, the Armenian version of the history? There was an Armenian problem for the Turks created by the advance of the Russians, and also there was a population with an anti-Turkish sentiment in the Ottoman Empire who sought independence, and they overtly sympathized with the Russians advancing from the Caucasus. Also, there were Armenian bands, the Armenians bragged about their heroic exploits in resistance, and the Turks had trouble to maintain order under the prevailing war conditions. For the Turks it was necessary to take the punitive and preventive measure against a hostile population in a region threatened by foreign invasion. For the Armenians it was liberating their land. However, both parties agree that the repression was geographically limited; for example, those measures did not affect the Armenians who lived in the other parts of the Ottoman Empire. No one has any doubt that terrible events took place; the Armenians, as well as the Turks suffered and perished in equal measure. Yet, no one will be able to tell what the circumstances were like, and how many people died. Consider, for instance, the case of Lebanon [Beirut] that took place recently and in full view of the entire world. During their [the Armenians] relocation to Syria [an Ottoman province at that time] hundred thousands of Armenians died on account of famine and epidemics. However, when you brought up the question of "genocide", you imply that there was a deliberate policy of extermination, to annihilate systematically the Armenian nation. This is very doubtful. The Turkish documents prove an action of relocation, not extermination. Are there ulterior motives for promoting or denying the Armenian Genocide? Yes, the question of motive has been difficult to determine for many researchers. It must be noted that there is much to gain from promoting the recognition of the Armenian Genocide as well as denying the recognition of the Armenian Genocide. Establishing the Armenian Genocide as legally genocide would enable international courts and organizations to pressure the current Turkish government to hand over reparations to what they established as sufferers of genocide. They would be able to demand land internationally from Turkey and possibly use international legal authorities to pursue that demand. They create a sense of unity and nationalistic solidarity amongst Armenian nationals who feel that they have been unfairly victimized in World War I. The sociological effect of a "common enemy" and "common cause" against the Turkish government makes Armenian politicians less accountable for their failures at home since they focus their attention to problems abroad. It would help rid the Armenian people or other responsible parties of the guilt they feel for the massacres of Turks, Kurds, and other ethnic groups during the collapse of the Ottoman Empire. Admitting fault is very difficult for nationalists. Disbelief that the deaths Armenians had could be the result of the Dashnaks they have had to depend on for their independence. Disbelief that their own people (whom they see as good Christians) could be responsible for atrocities. Being condemned for genocide seems to contradict to the way they grew up in the society of their people. Disbelief in such horrible atrocities near the end of the historically peaceful Ottoman Empire. Disbelief that Turks, Kurds and other Muslims could have perpetrated the same attacks as the Dashnaks and Hunchaks. The ulterior motives do not mean necessarily that one side is wrong and the other is right. The Armenians suffered great tragedies and so did the Turks and Kurds near the collapse of the Ottoman Empire. Determining whether there was also state involvement is difficult and may simply not be true. Does AGD deny Armenian deaths or sufferings? No, it is well established by Armenian historians and Western scholars, that Armenians did indeed suffer and die in large numbers indirectly or directly by massacres or relocations. However, genocide means there was intent by the government or intent by the groups responsible for massacres to eradicate a certain group, as defined by the United Nations. Yet no proof has been uncovered of intent for over 93 years. Do not confuse "Genocide" with "Massacre". Western historians do not deny the Armenian Massacres, they simply believe that the label of genocide is too extreme and unfounded to be applied in this specific case of ethnic conflict. Some propagandists today have been working hard to equate the Holocaust to the Armenian Genocide thesis. They use words like "historical revisionist" or "denialist" to describe people who do not accept the accusation of the genocide. When confronted, they argue that the Armenian Genocide label is well established by an overwhelming majority of historians, but this is simply not true. Sometimes Armenian rebels, volunteer units, or locals engaged in ethnic cleansing of the overwhelmingly local Muslim population, sometimes these Muslim populations retaliated ferociously and sometimes preemptive massacres were conducted, and such horrific actions are inexcusable. The CUP government, in a desperate attempt to protect their land ordered that Armenians in suspected rebelling provinces be removed to Syria provinces and Mosul, Iraq, the provinces are mentioned specifically in the archival documents. However, there was no evidence of intentions of the CUP government or encouragement by any of their high ranking officials to exterminate Armenians, hence why it is not genocide. The debate of genocide is in the fact that the CUP government ordered forced relocations of Armenians. Armenians believe that this forced relocation caused the deaths of many Armenians and thus constitutes genocide. Turks believe that this forced relocation was the last resort to restore order to the lawless east where Armenians had been rebelling and it was standard for empires/nations at the time to put down rebellions in this fashion but that mistakes were made. Some of our writers explain what really happened in 1915. Individual writers may have a biased perspective. No, Armenians did die in large numbers, but unfortunately this does not prove genocide, there are many other reasons why these death tolls are high. But this does not excuse the terrible deeds committed by Ottoman citizens (Christian or Islamic) who attacked innocent civilians and/or massacred them for whatever purpose. Large numbers of Armenians did die and suffer at the hands of locals. Sometimes they were provoked, and sometimes unprovoked. Sometimes they were justified somewhat, and other times they were unjustified. This is a complex history of isolated massacres due to increase tensions of nationalism in both Turks, Kurds, and Armenians, as well as the tensions created by Balkan massacres of Muslims and Armenian massacres by locals. It is important to note that such tensions in Eastern Anatolia increased the death tolls of many Turks, Kurds, Armenians, and other Ottoman citizens. The key concept in proving genocide, is the definition of genocide being the proof of intent. 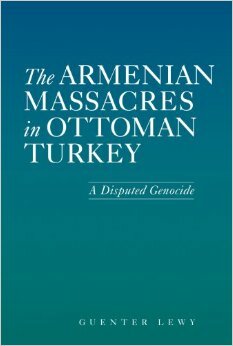 Armenian historians have provided only two examples of archives directly ordering the genocide. Unfortunately, these were later proven to be forgeries. So Armenian historians such as Vahakn Dadrian, then decided to conclude that such documents exist and they are authenticated simply because many Armenians died, and so "there must have been genocidal intent." This is dangerous speculation, because there is no authentic proof or evidence that shows that the Ottoman government was planning on exterminating Armenians in part or as a whole. There is substantial archival documents and telegrams showing that the Young Turk Ottoman government was trying to prevent the massacres and killings. Is this a propaganda site? No, a propaganda site presents a view that is not based on facts, but based on an agenda to mislead the reader into believing something that's not necessarily true. Our website does not promote propaganda, if you feel that an article is biased, please feel free to contact us. AGD offers analysis and facts to present views on an controversial issue. We present a neutral view; we do not claim that only Turks were killed by Armenians during World War I and we do not support the "Turkish Genocide" allegation. Furthermore, we also do not support the "Armenian Genocide" allegation because we do not believe that only Armenians were killed as a result of genocidal plans. We strive to show that while many Armenians were massacred, they were not massacred by the government's orders or encouragement. So when you hear anyone call someone who disagrees with the term "genocide", as "denialists" or "revisionists", you should remember that conclusions and research constantly changes. Furthermore, facts can be misinterpreted to lead to a different conclusion in history. History does change; it is a science, that continuously is corrected to represent the truth. When organizations want others to think that refusing to accept the term "genocide" to interpret complex history, is "denialism" or "revisionism", please consider that research can change and that such thinking is what led to genocides in our world in the first place. Does this site promote Anti-Armenainism or Anti-Turkism? No, AGD is a site that shows evidence, archives, and analysis on a subject that is controversial. Controversial subjects can lead to outrage especially if a party tries to interpret controversial events. Thus, proponents of opposing views like to label websites as "hate sites" in order to suppress the truth and the different interpretations of others. AGD promotes neither Anti-Armenianism nor Anti-Turkism, it does not support racism, sexism, ageism, or hate towards any group or individual. If you find anything that sounds hateful in our website, please report it to our administration using our contact page. When our website draws conclusions on events based on research, it does not mean it is promoting hatred towards any group. Sometimes individuals may find certain conclusions offensive because of their religion or core beliefs; however, that should not justify the suppression of someone else's freedom of speech.